Dreamforce, "four epic days that fly by, but stay with you forever," concluded yesterday in San Francisco. 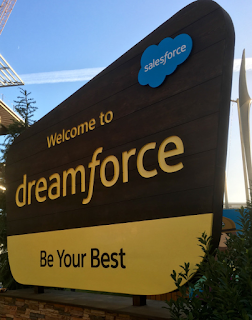 Salesforce once again pulled out all the stops to educate, entertain and evangelize an eager crowd of more than 150,000 users. "Dreamforce epitomizes a new breed of user conference," says Emily He on the DoubleDutch blog. That new breed of conference "looks beyond the horizon to build a community that focuses on honoring your customers’ and prospects’ needs and desires," He says. Honoring attendees' desires means delivering "all of the content they care about, whether it involves your solution or not." How many corporate event producers look past their company's present horizon? I know one major cloud computing company that nearly scrapped its mammoth annual event, "because we have nothing new to say." Feature diverse speakers. "Think beyond your industry’s usual guest list," He says. "Your attendees care about more than their jobs, and they want to hear from people who’ll change the way they think about the world at large." Elevate attendee engagement. Deliver a memorable experience through parties and concerts. Facilitate workshops and small gatherings throughout your event. Provide an app that lets attendees make impromptu plans to meet up and amplify their experiences through social media. Exploit your content. Videotape the best presentations and target people unable to attend the live event. Curate event content as e-books and blog posts. Ask top presenters to join you on a road show. "While a stellar live event can be a large investment, it can be extremely effective in fueling your pipeline," He says. "A single successful event, if done right, can power your entire marketing strategy for the year to come."